Sgt. 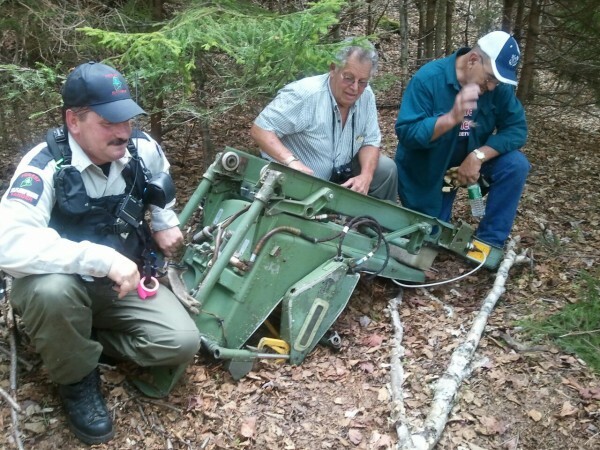 Bruce Reed of the Maine Forest Service, Pete Pratt of the Moosehead Riders Snowmobile Club and club member Dave Demers examine the B-52 ejection seat Reed found while hunting last fall after a hike on Elephant Mountain on May 24, 2012. Moosehead Riders Snowmobile Club member Dave Demers (facing seat), Forest Ranger Doug Huettner (center) and Ranger Pilot Chris Blackie wait to start the long climb down Elephant Mountain with a B-52 ejection seat on Thursday, May 24, 2012. The seat was recovered from a crash that occurred in 1963. 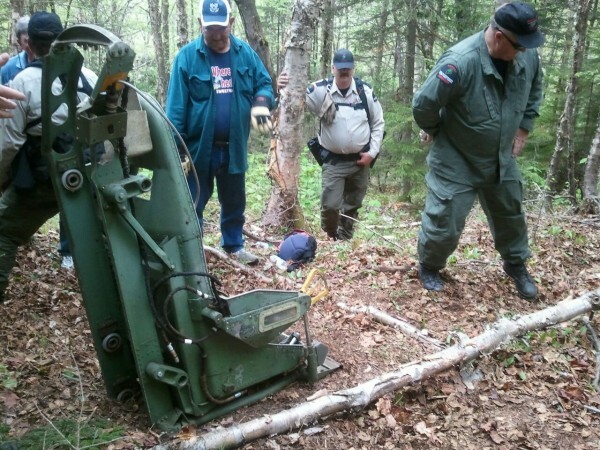 TOWNSHIP 8, RANGE 10, Maine — Presumably the last person to sit in the ejection seat Maine Forest Service rangers hauled from Elephant Mountain on Thursday was a B-52 crewman enduring the most harrowing experience of his life. But which crewman? Was it Maj. Robert Morrison, co-pilot of the doomed U.S. Air Force bomber? Was it Lt. Col. Dante E. Bulli, the pilot of the B-52C trainer? Or was the seat occupied by someone else? Had the seat somehow been wrenched from some unaccounted-for remains of the crashed jet in the 49 years since it slammed into the mountain? Pete Pratt hopes to find out. The Moosehead Riders Snowmobile Club B-52 coordinator, the man volunteering to continue to build and maintain the memorial the club helped create to the 1963 crash, said he will contact the airplane or seat manufacturer to see if serial numbers taken from the historical find can be traced to its position within the jet plane. Pratt said he is confident that the seat is part of the bomber that crashed on Jan. 24, 1963. The B-52 had left Westover Air Force Base in Massachusetts as part of an Air Force test of the eight-engine jet’s handling in low-level flight. Its crew was an extremely talented and experienced set of fliers, Pratt said. The jet was at about 300 feet and traveling at 300 knots, or about 345 mph, when it encountered severe turbulence as it sped into the Greenville area. Bulli climbed to avoid the choppy air when the plane’s vertical stabilizer tore from the tail section, according to a history Pratt provided. Bulli, Morrison and Capt. Gerald J. Adler, a navigator seated in the electronic warfare officer’s position, managed to eject in the short time before the plane banked right, curved around the mountain and crashed at about 2:50 p.m.
“They had 10 to 15 seconds to decide a course of action,” Pratt said. Morrison was killed after leaving the plane when he hit a tree. Bulli suffered a broken left leg, and frostbite eventually cost Adler his left leg. The two men endured about 18 hours in subzero temperatures — it was 29 degrees below zero that night — before rescuers contending with about five feet of snow could get to them, the history states. Pratt said he contacted Adler and Bulli shortly after Sgt. Bruce Reed of the forest service found the seat while hunting last fall. The veterans told Pratt that they preferred that any wreckage remain where it was found, he said. But the chair recovered Thursday is outside the approximately 1½-mile no-salvage and no-harvesting zone created by Scott Paper years ago and maintained today by Plum Creek, Pratt said. “We felt we should retrieve it and make it visible so that [residents] will know that it was somebody in that seat who was working to protect us,” Pratt said. The seat is the third recovered from the crash and preserved for public viewing. One is at the snowmobile clubhouse in Greenville and in shape remarkably similar to the seat recovered Thursday. A third is in a Bangor museum, Pratt said. The seat was within the 1½-mile tract between the area where the stabilizer was found and the plane’s main debris field. It was absent its head rest and gradually curved inward on its left side, suggesting a powerful collision with something, perhaps a tree. It weighs 80 to 95 pounds, said Ranger Doug Huettner, one of the four rangers who used netting to lug the seat down the mountain. Reed marked the spot the chair was found with his GPS. The rangers discussed whether the chair was found where its occupant had left it or where someone else had carried it. Its weight and the rough terrain argued against its having been moved, as the “logging road” on which it was found was heavily overgrown and probably not used since the 1950s, Huettner said. Pratt doesn’t have much use for speculation. Two companies got salvage rights to the B-52 years ago, he said, and he doubts that anyone could know what debris remains in the woods or what was carted away by passers-by or the salvagers. Reed was pleased that he found the seat and that the rangers got it down the mountain.